We spent this week still waiting on the carport permit. This is so frustrating as it's about length of nails, amongst other things, a not understanding all the rules before getting into the game, and a city that doesn't appear to have enough employees to cover those needing permits getting them in a timely manner. If we were in the county, as we had been when we bought this place, the contractor would already have the carport built. As it is, process puts him and us on hold and not a thing we can do about it as any rushing the gun and starting to build without a permit and inspections would lead to a $500 fine and maybe having to undo what had been done. The power is in the hands of those who have no reason to worry about our schedule. Enough whining on that. We had two things interesting-- to us-- happen this week. One happened to everybody. The other was just for us. The first day of spring was Wednesday and along with it a full moon that is called by various names. Most common is worm moon. It's that because warmth brings earthworms out from the soil. But come on. That's not a pretty name for a beautiful full moon. I prefer one of its many alternates-- Crow Moon. They say there won't be another full moon on the spring equinox for 11 years. Seems all of these moons have something that won't be seen again until some distant time. I guess this particular combination last happened in 2000. That was a pivotal year in my life but not sure it had much to do with the moon. As for 11 years before the next, at my age, I might not be here (at least in this body). If reincarnation is true, I could be back but would I want to as things stand? Maybe reincarnation is not a choice, but if it is, I'd have to think about it as after 75 years building up this life, starting all over doesn't have much appeal. Some consider reincarnation though to be a curse, not a blessing-- like you have to keep going until you get it right, which means all of us here did not get it right previously (that would explain a lot). There are several theories on it though-- another being that there are those who choose to come back as enlightened souls to try and improve the world. Do I believe any of that? I am one of those who just doesn't know. You do hear people talk of old and new souls though. Pure speculation either way even for those who have memories, which could be explained many ways. 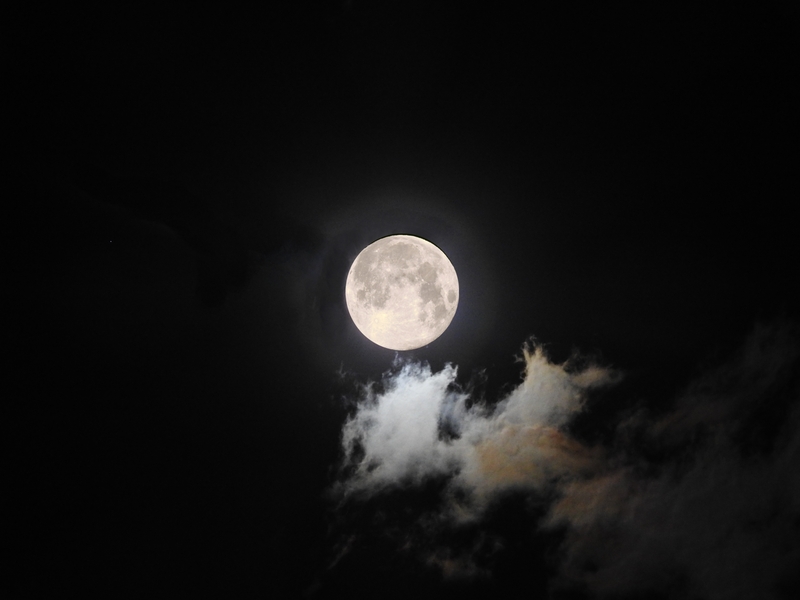 Back to my topic, this full moon was the thing that happened to everyone. We wanted to capture it in photographs, which proved interesting in terms of how to get what you want in one photo. Do you think what you see in a photo must be true? That's an irony of our time that photos are supposed to prove things. They don't have to. Photoshop now puts altering photos in everyone's capability, where in the past it was done in dark rooms and took the skill of an Ansel Adams to do what can now be done on a computer. The Crow Moon was a good example. The photo on top is exactly as it was seen and because the sky was rather light when it was rising, the details of the moon and the clouds showed up. The one right below here is also just as the camera captured it-- but not as the eye saw it. The camera lost the moon's details in order to capture those of the clouds. So this is where photo-shop can come into play. I left this one alone because I liked the glow and how it threw across the sky that beam of light. I had though other options, individual moon shots that did show the detail. So what you will see next will be first the original photos, all taken by Ranch Boss, and then how I copy pasted in another moon shot of just the moon, on a different setting, at the same time. 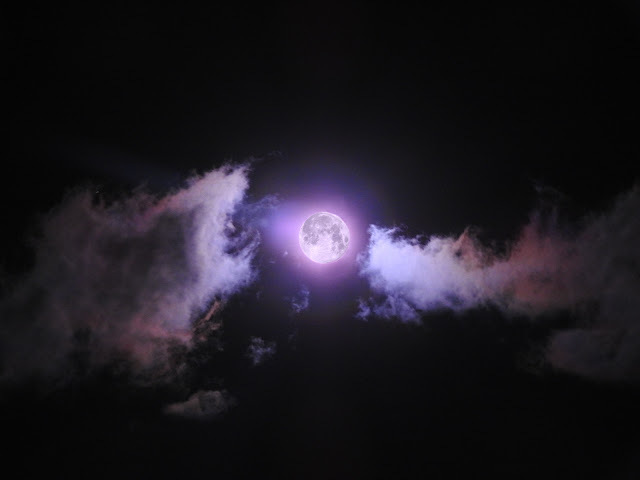 Because the shots varied for color, I altered the moon a little to make it fit the clouds. In one, I had the moon the same size as it had been. In the other, for a mystical feel, I made the moon the size of its glow. In a way, they are all exactly true... and in another, they are not. Kind of like life. Each are pretty in their own way. So which is truest? In a way both. I am keeping my fingers crossed on your permit being approved. On photos of the moon, they are pictures and not the real moon. Being a painter I know all photographs are not the real thing. The reality can only be the expression of your reality when the picture says what you want it to. I agree worm moon doesn't sound as great as the moon is. But why crow? We have many robins eating worms in our yard. Why not robin moon? I don't know why Crow Moon. It's just one of the options. (Crust Moon, Sap Moon, Sugar Moon, and Chaste Moon-- probably many others). I like crows and ravens though; so I preferred it. I also hope that permit gets approved on Tuesday (the first time it could now given days off). I wish they could recognize the difference in homes in their city. Our is kind of a simple neighborhood, not ritzy at all. I guess though the problem is structural not our design. They seem like nice people but there is a lot of growth here which is part of the problem. The problem for us is it keeps us from taking more little trips as we try to get this done. Hope you get yours done soon, so you can take those little trips. Ah, to Native Americans the cawing of crows at the March full moon signified the end of winter. Ranch Boss has been down there multiple times and has learned something about their system each time. The problem is we came into this not knowing any of their process. I just hope we get it through as our contractor needs the work to be defined also. Interesting moon photos and like the idea of adopting Native American names for nature’s creations. Surely do hope you get that permit. Fortunately, have not had to get involved hurrying up inspections after timely issuance of permits with both electrical and construction work I’ve had done the past year. I was surprised how many times they had to come out to inspect on just portions of a cement block section reconstruction of a restraining wall and disconnection from a neighbor’s wall pulling mine down. Issues there have not been welcomed by me and avoided by neighbor.